The distance of deviation from the orbital line, which is essentially a straight line toward the Sun on the approach, is not great, approximately 37 million miles. This relatively slight distance is enough to grant the 12th Planet the sharper angle it seeks. At this point the orbit of the 12th Planet has been altered, as the Sun is the only giant it is listening to. The 12th Planet maintains this line of orbit as it leaves the Solar System and travels out. In the scheme of things, this puts a slight lift in the orbit, as though the orbit between the two foci were your arm, extended out from your body, and the part of the orbit past the Sun were your hand. If you lifted your hand at the wrist slightly, a 21° lift, you would simulate what the 12th Planet's orbit is doing at this point. The 12th Planet maintains this deviation until it again passes your Sun, the second pass. It does not find it necessary to pull away from the Sun on this second pass, as the angle is correct to begin with. The Westoverton circle, discovered in the UK on July 31, 2003, shows what appears to be a key. As noted in the photos in a recent ZetaTalk on the difficulty NASA et al are having determining the path of Planet X within the solar system, Planet X came in from the direction of the Orion/Taurus constellations, moved around the Sun to the right, and has been between the Earth and Sun for some weeks. Viewing in late March from the Northern Hemisphere had the Sun setting well to the right of where Planet X could be found. By the Summer Solstice, Orion/Taurus were behind the Sun with the Sun moving to the left of where Planet X appeared in photos. Clearly, Planet X was close to the Sun. By the Fall Equinox, if Planet X were moving in a straight line and in a retrograde motion, it should have passed the Earth in its orbit, but it was appearing in photos as near the Sun and heading toward Earth. Thus, in passing and avoiding the Sun, Planet X had obviously changed it path and veered to the right. Note the ZetaTalk quoted above states a 21° change to the path. 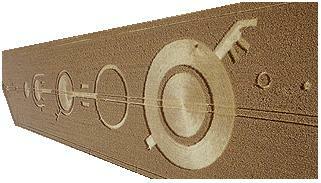 Is this not what the Westoverton key crop circle implies? As the circle was laid down on July 31, shortly after the Summer Solstice, in the UK, a Northern Hemisphere location, the eye of the viewer can be presumed to be that location. If the first leg of the key points to the Fall Equinox, what does the second leg of the key point to?